100% digital, explore the BRUGEL annual report 2017! The digital version developed in French and Flemish is related with the leading social media, and you can easily share the information with your friends, co-workers and partners. 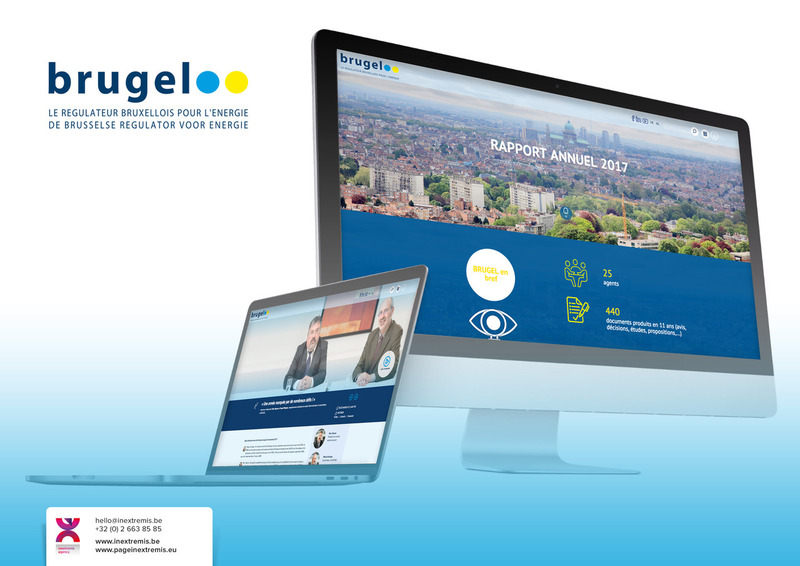 Many links with the new BRUGEL Website offer the opportunity to access exciting and complementary information. In the near future, videos and animations will enhance the online version in addition to the information of a report in the traditional format. The online version can be consulted on a smartphone as well as on a tablet or a computer. By visiting the online version, you can download the whole report in PDF format or just some chapters, thanks to the download centre, which can be adapted to your needs. BRUGEL is responsible for advising public authorities of the Brussels region on the organisation and functioning of the regional energy market on the one hand, and on the other, on a general mission for the supervision and control of energy. BRUGEL has also strategically defined its commitments for efficient market functioning, smart grids and vigilant consumer protection. The Communication Agency, Page in extremis is proud to have participated in the writing, designing and producing the report. The result is an impactful online publication made within an intimate creative dialogue framework involving the Belgian communication agency’s creative team and the BRUGEL communication team. The communication agency, Page in extremis turns brands into valuable assets and ensures the alignment with their strategic objectives. 1) The definition of a “brand strategy”. 2) The creation or refreshment of your visual identity supported by easy to use guidelines. 3) The improvement of your “Communication Programme” by incorporating integrated communication campaigns, memorable events, amazing publications and innovative digital solutions. 4) The creative development of innovative communication tools (print and digital). Based in Brussels, the communication agency makes brands conversational, helps organisations manage their communities, engage with their stakeholders and convey their messages.